Many user Interactive Electronic Circuits are mostly requires touch sensor or touch switch. Capacitive proximity touch sensor or switch can be used for better and effortless process and user interface. 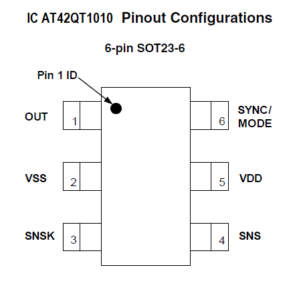 In this article we are going to see the design and specifications of one channel touch sensor IC AT42QT1010 from Atmel. By using AT42QT1010 capacitive touch momentary switch circuit is designed to provide momentary output at LED or you can replace the LED into your required output activator. It is a digital touch sensor IC that is capable of detecting near proximity or touch, and it can be ideal for implementing touch controls. AT42QT1010 available in 6 pin SOT23-6 package and 8 pin UDFN/USON package. Here we have used 6 pin package IC and all components tested in this circuit are SMD components. This AT42QT1010 IC has 6 pins, here SNSK, SNS (pin 3, 4) are the sense pin and it can be connected in single plate pad or double plate pad (capacitive pad). 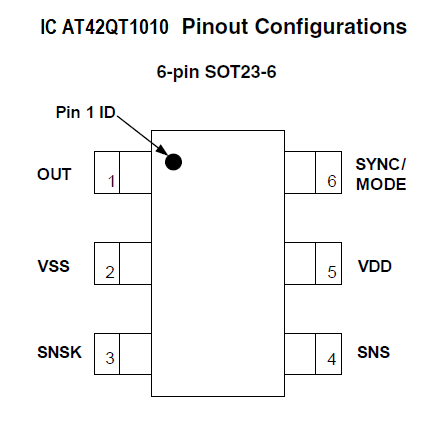 Pin 6 (SYNC) is responsible for SYNC and mode input. Pin 5, 2 are taking Vdd, Vss power supply and pin 1 gives output during the touch occurs. After connecting all external components, connect touch pad it can be either single copper plate or double copper plate with insulator in between. Some breakout boards of AT42QT1010 uses PCB tracks as a capacitive touch pad. Here output LED glows as long as the sensor pad area is touched, and the capacitive touch pad or sense pad can be extend with wire and almost any conductive material. This sensor IC can work with 1.8V to 5.5V power supply. The JP 1 (junction point 1) is help this circuit to change the mode. Mode 1: Fast mode – Fast response time 1ms delay between samples and consumes 200μA to 750μA. Mode 2: Low power mode – Slower response time 80ms sleep at end of sample, switches to fast mode upon sensing. Consumes 15μA to 75μA current. 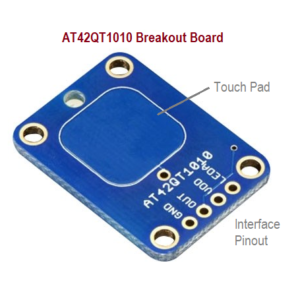 lot of capacitive touch sensor breakout board based on AT42QT1010 available in market, you can avail that if you want plug and play in your prototype. 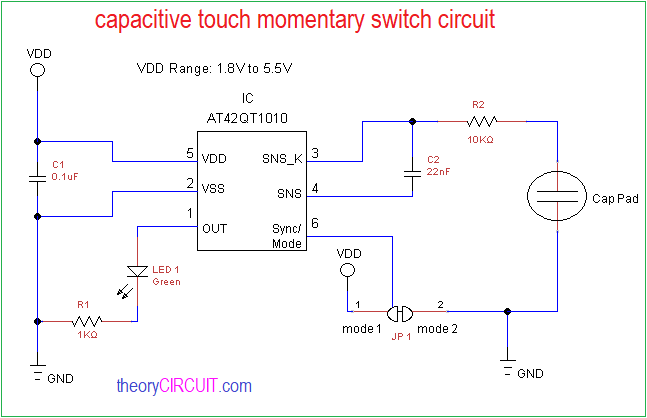 If you need to customized capacitive touch switch then you can refer this circuit.